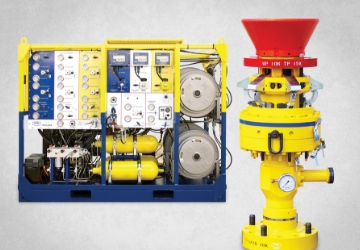 FHE, a manufacturer of pressure control equipment based in Fruita, Colorado, has designed a product that is revolutionizing wellhead connections, dramatically making the process faster, more efficient and, most importantly, significantly safer for workers. We are excited to be part of the roll out of the RigLock™, having supplied our dealer partner, Diesel Services, with Perkins’ 403F-11 engines to be used in this clever system. FHE is familiar with Perkins’ reputation for durability and reliability, having used its engines in the past. The company needed an engine that could fit in a compact space and provide the power density to propel the RigLock. The 1.1-liter, 3-cylinder Perkins 403F-11 was the clear favorite among the engines tested to operate the RigLock’s control unit. The engine also operates well in extreme weather conditions, had the lowest vibration of engines tested and comes with a service network capable of reaching FHE’s global custo mers. Beyond the performance measurements, the engine meets Tier 4 emission standards and its fuel efficiency means an overall low cost of operation. “It’s the best engine we’ve used to date,” said Nick Snoke, FHE president. The RigLock utilizes a piston and cam system to connect surface equipment to a wellhead. The equipment is lowered from overhead and guided into the wellhead where six primary locking cams secure the connection. A secondary mechanical locking ring is lowered to anchor the cams. The locking system will remain in place even if hydraulic power is accidentally lost. The operator manipulates the RigLock using a control panel that sits several hundred feet away from the wellhead, allowing the operator to oversee the operation at a safe distance. 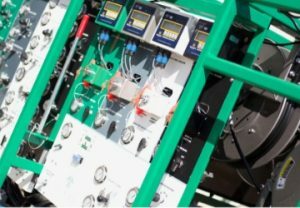 The control unit, which is customized to each customer’s specific needs, also features a quick test manifold and 2-inch 1502 pump and sump port, and integrates with a digital well monitoring system. The traditional method of connecting wellheads puts workers at the dangerous intersection of equipment that frequently results in worker injuries. The focal point for the FHE design was to develop a system that protects rig workers. The RigLock takes at most 60 seconds to secure the equipment to the wellhead and can handle three wellheads at once. Most importantly, workers are nowhere near dangerous pinch points and overhanging equipment.